…is a group for Mums, Dads and carers with pre-school age children. We meet on Wednesday mornings, during term time, from 9.30 until 11.00 at the Jersey Farm Community Centre. 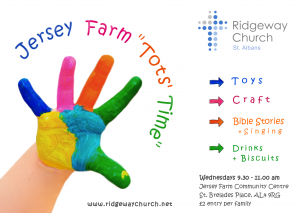 There are toys, craft activities, drinks, biscuits and at the end of the morning a short singing and Bible story time. Why not come along and have a chat with people in similar situations and make new friends. We look forward to meeting you!